The hole on Georgia Street has been a hazard. 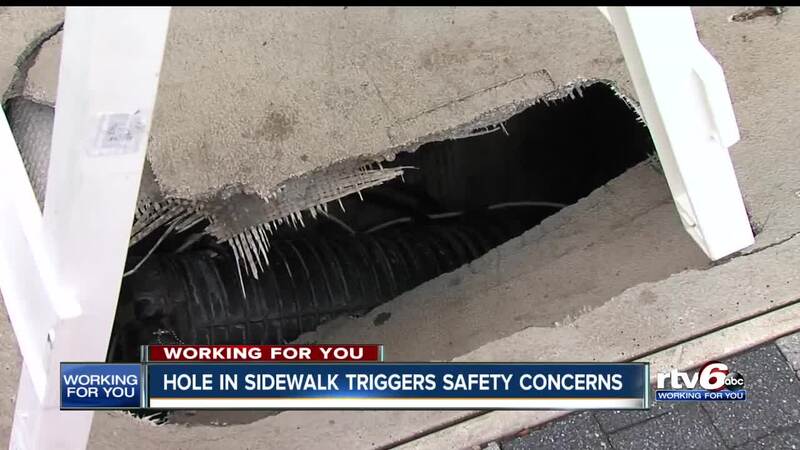 INDIANAPOLIS -- A utility access panel cracked and fell apart in Indianapolis, creating a hole in a downtown Indianapolis sidewalk. Anita Hall said she was walking after dinner on Sunday and almost stepped in the hole, which is at 126 W. Georgia Street, in front of a parking garage. She spent the next two days making calls, trying to get somebody to help. "I called Citizens Energy, IPL, and DPW," Hall said. "Having Citizens and DPW say, 'You know what? We've gone down there and it says that it's not our responsibility.'" DPW left a frame Tuesday to mark the hazard, and IPL replaced the panel Wednesday. The issue was first reported to the Mayor's Action Center on Aug. 27. The city called it an IPL issue and notified the utility about the problem. "This should not be a bureaucratic matter," Hall said. "This is public safety."